When we were in London working (on the British Council video project with schools), every day on our way to the second school, Rose and I would take the tube from Brixton to Seven Sisters, change to a train and get off at can't-recall-name-of-stop, where we would call a cab from a particular cab company. 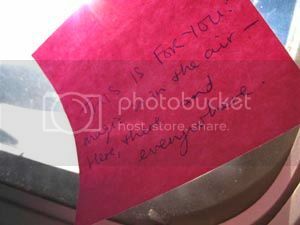 On our journey, we would both stick Post-It messages in random public spots (mine were flurouescent pink, hers were bright blue). On the second-to-last day when we were in the cab, as we reached the school, I stuck a Post-It on the back of the passenger seat. Something told me not to, because a cab felt more 'private' than 'public' ... but I left it anyway, thinking it was a harmless gesture. It said: "This is for you: You are in the right place at the right time. Look around you." (N.B. I used to pre-write these notes so it would be easier to pull one off and stick it quickly without having to spend time writing on the spot). In my context, that message meant - where you are is where you are meant to be, everything is as it should be, look around you and see that life has a lot to offer, etc. (In retrospect, maybe it was a bit abstract ...). The same cab driver, a Somalian, came to pick us up - but in a different car. As we got in, I noticed the pink Post-It on the tray between the two front seats (he had specifically brought it with him). Two minutes into the drive he handed it to me and asked me if I had left it there yesterday. I told him yes and explained the project - that my friends and I are doing it throughout the city, to uplift people, transmit positive messages, etc. The cabbie began to tell me that it was not positive, that a passenger had entered the cab, got scared and said he was not travelling with him, went to report him to his bosses at the cab company who then got hold of the pink Post-It note and analysed it. In their analysis they said it was a negative and threatening note, especially as it was written on RED paper ... and they wanted to report him to the police. By this point Rose and I were looking at each other in disbelief. The cabbie incident did not stop me from sticking up Post-It's, but I was more cautious about where I left them, based on people's potential level of paranoia. In airports, for example, the simplest thing could be interpreted as a terrorist threat ... like "HAVE A NICE DAY". I removed the Post-It on the airplane window above (KLM to Amsterdam) ... just in case. I felt so sorry for the cabbie - and that an innocent, well-intended situation had gone so awry. I told him I would call or write a note to his employers and he was very grateful. He said "Yes, you can write a note" and gave me some paper. I wrote a long letter saying who I was, outlining the project, apologising for the misunderstanding, saying it was unfortunate that something intended to be positive had been perceived as a negative, stressing that I was the one who had written the note and not Driver #35 and that he had known nothing about it, so don't punish him for it, etc. He seemed relieved by what I wrote and stuck the Post-It to the letter (I guess to show his bosses it was the same handwriting and that he didn't write the letter himself). As Rose pointed out, people in London are still tense after the bombings and the message most likely came across as a threat of danger. The moral of that story was: write more clear cut messages and note where they are placed in the event that their physical or cultural context gives them a different meaning. (But still ... you can never really know how someone will perceive something ...). The moral of the story is 'dont stick any postits anywhere' What if the people did not accept your explanation and you were arrested. probably that is why no one has responded to the postits in the first place. Do you think if you saw a message like that some where how would you take it? always place yourself in the situation. Every action has a reaction..whether positive or negative. I could not help but chuckle at this incident despite the seriousness of it. It truly is all about perspective and I want to venture categories of individuals....the first thing that jumped to mind was "Only an artist would do something like this".....not a comment to be taken negatively. I've to agree with Anonymous somewhat "don't stick post its just anywhere".....although a cute idea......I suppose more analysis has to be considered ...like in that case the country you are in ... high stress is a way of life... terrorism is a way of life. Random notes will be perceived as the armageddon LOL....put that same note in Trinidad and the average Trini would laugh it off as a mad person. It is important to really analyze your context sometimes before embarking on ideas I guess....we no longer live a virgin world where curiousity for the unknown thrills. Life is just different. Perhaps formality is more acceptable...where purchasing mini billboard space in random locations might actually be received more positively....which is sad. The idea of the photographs is cool and may not be interpreted as negatively....depending on the images. I suppose the written word feels more threatening because it is so final and deliberate. .... however again context ...the society in which we live.....a pleasant sunny photograph of a park and swings could be interpreted as a warning....the photographer will strike at that location next! who knows what people will think but I can see that 90% of the time dire consequences (arrest/warnings) could follow. however...it's not words of discouragement.....just thoughts from the average jane. On the note of context.....a project like that here might be embraced and even make it to citypulse news! Toronto is embracing of artistic expression that is "out of the ordinary"
P.S. really enjoying the blog in my limited spare time. Anonymous #1, the moral of the story is - you can't please everyone. Anonymous #2, yes every action has a reaction whether negative or positive. If I were to spend time worrying about whether someone's reaction would be negative or not I would never do anything. What I see as positive someone may see as negative and vice versa. Different strokes. Well just like you said....different strokes for different folks...u nearly cost a man his job.. as much as i enjoy your creativity sometimes i wonder how far you would go to express yourself on to others. yes the society or a country may need some upliftment but ya might need to rethink what you do when you venture out of your own country. that situation could have been worst. It is easy for people speak out to me about putting 'positive' (subject to interpretation) Post Its in public places ... and not speak out to the person who throws garbage out of the car window, casually places a beer bottle in the drain when the dustbin is right there, breaks a major road or red light ... and blatantly continues to do careless and unthinking things that have become 'acceptable' simply because we are in TT and we take it all for granted that "da's de way it is". As long as we continue to think that way, "da's de way it go always be."